Shares in beleaguered Finnish mobile phone giant Nokia soared on Thursday after it published partial fourth quarter earnings that were better than expected. The share climbed 15 percent on the Helsinki stock exchange before slipping back to close up 10.8 percent, as investors cheered the company's announcement of an eight percent increase in sales in its Devices and Services unit to 3.9 billion euros ($5.14 billion). "We are pleased that the fourth quarter of 2012 was a solid quarter where we exceeded expectations and delivered underlying profitability in Devices and Services and record underlying profitability in Nokia Siemens Networks," chief executive Stephen Elop said in a statement. Nokia is scheduled to present its full fourth quarter and full-year 2012 earnings report on January 24. The company sold a total of 86.3 million devices during the quarter, it said, including 4.4 million Lumia smartphones, its new flagship product developed with Microsoft. Nokia said that was "better than expected." "After almost consistently posting mostly negative results and missing frequently estimates for several quarters it might just seem that Nokia is finally on the way up, having beaten estimates and their own previous outlook," ETX Capital analyst Markus Huber said in a statement. "However, although this is overall good news, investors will most likely remain cautious as this is only one set of better than expected data and with competition especially from Apple and Samsung remaining fierce it needs to be seen if Nokia can repeat this performance in the quarters ahead," he added. Haakan Wranne, a telecom analyst at Swedish bank Swedbank, agreed. "It looks pretty promising for Nokia, but it's too early to say they're out of danger," he said. 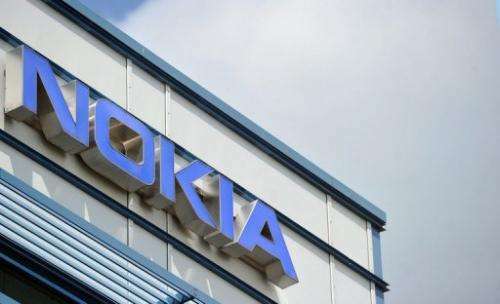 Nokia was the world's number one mobile phone maker for more than a decade but lost that title to Samsung in 2011 and has registered six straight quarterly losses.